The Poppy lamp is gracefully shaped a in a brilliant deep red. 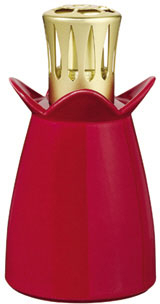 It is produced for Lampe Berger by Jars in ceramic and comes in a nice Lampe Berger gift box with funnel, burner and instructions. This lamp is now retired.